The resources on this page have been created in collaboration with AQA, to support their new GCSE specification for Science. They are free so please dive in - we hope you enjoy using them! Find the complete teaching pack and other resources for the new Combined Science: Trilogy, Combined Science: Synergy, GCSE Biology, GCSE Chemistry and GCSE Physics. For more information about the new specification, go to AQA’s GCSE Science page. 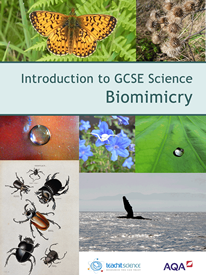 This resource is a collection of teaching ideas and student-facing resources (all of which were specifically commissioned), on the overarching theme of Biomimicry. Biomimicry was chosen as it's an exciting area of research that extends across scientific disciplines using inspiration from nature to help scientists solve contemporary problems. The pack aims to bridge the gap between what students will have studied at KS3 (e.g. energy transfer, chemical reactions and photosynthesis) and areas studied at GCSE (e.g. nanotechnology, nerve impulses and forces). W2L3 What's special about a lotus leaf? W2L2 What can we learn from termite mounds?